The cross-platform database application from FileMaker Inc., FileMaker Pro is know for its ease of use. It integrates the database engine with its GUI-based interface, which allows users to modify the database by dragging new elements into the layouts/screens/forms that provide the user interface. It allows users experience or not to easily use this database. Version 7.0 lets you store and manage huge volumes of complex data such as text, video, images, audio, PDF’s, and more. The price tag isn’t cheap though at $299, but the added features makes it a great handy program to have on hand. In addition if you want to upgrade you will need add $149. Its good for either business or home use. You get a single tool that can organize, sort, and retrieve data for customer tracking, inventories, and so on. 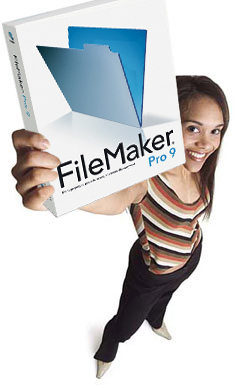 Filemaker Pro’s other newer versions like Filemaker Pro 9.0 allows users to create files that require much greater power and flexibility. Filemaker 9 also incudes the ability to connect directly to a number of SQL databases, including MySQL, SQL Server, and Oracle. SQL databases can be used as data sources in FileMaker’s relationship graph thus allowing the developer to create new layouts based on the SQL database, create, edit, and delete SQL records via FileMaker layouts and functions, and reference SQL fields in FileMaker calculations and scripts steps. All and all I think this program will give you a great tool for those that work with databases. Business or personal use, but with the price I believe its more geared towards business use than personal use. Databases are not easy to up-keep so all the help you can get is wonderful. I used to use Filemaker and I loved it. I moved away form it when I went to a PC. I downloaded the trial version and it is still a great program. I just wished it handled e-mail and it would be perfect for me. I would highly recommend it also.